© Photo: Hervé Véronèse Visitors admire the Hockney SUMO. © Photo: Hervé Véronèse Guests enjoying the warm summer evening on the terrace of Restaurant Georges. © Photo: Hervé Véronèse © Photo: Jean Picon David Hockney with artists Julio Le Parc (left) and Gérard Fromanger (center). 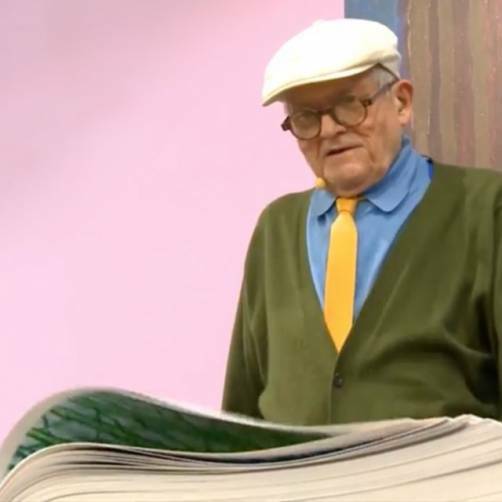 It was a blazing hot Monday evening when David Hockney’s eagerly-awaited retrospective opened at the Centre Pompidou in Paris. Visitors, journalists and VIP guests were all more than happy to immerse themselves in the British artist’s works of color, cooling down by the refreshing blues of masterpieces like A Bigger Splash. 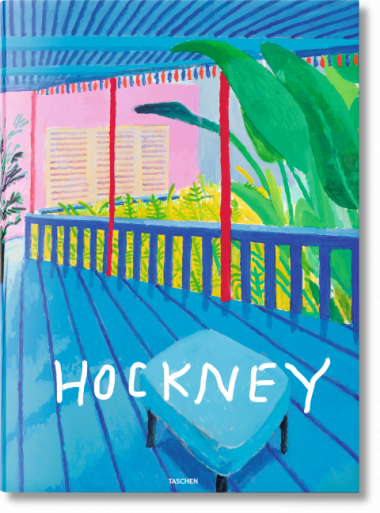 Following Hockney’s hugely successful show at the Tate Britain, this retrospective offers an even greater collection, spanning from his earliest paintings until 2017. 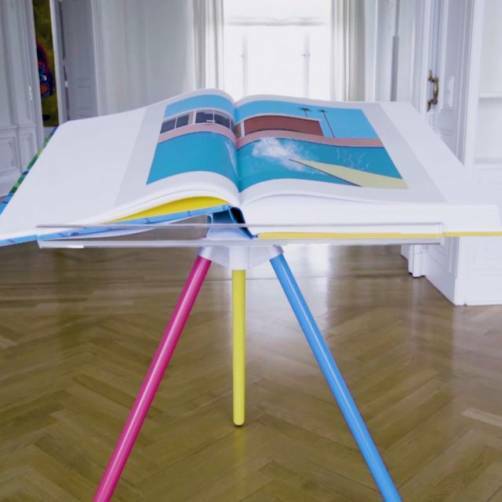 TASCHEN’s SUMO, A Bigger Book, was proudly displayed in its own Hockney blue niche as the pièce de résistance, wowing visitors on their way out. A very happy David Hockney decided to mark the occasion, painting "Love Life" in his signature blue on the wall leading to the SUMO. He then joined guests for interviews and pictures together with Serge Lasvignes, the President of the Centre Pompidou, Françoise Nyssen, the new French Minister of Culture, Curator Didier Ottinger, Jack Lang, former Minister of Culture, and Jean-Michel Ribes, actor, playwright and Director of the Théâtre du Rond Point, amongst many others. The exhibition tour was followed by a cocktail dinner hosted by TASCHEN and the Centre Pompidou at the exclusive Restaurant Georges on the top floor. Spending the last hours of the evening on the terrace, Hockney enjoyed breathtaking views of Paris surrounded by his friends and fans. Guests included art collectors and celebrities like Bruno Racine, former President of the Centre Pompidou, pastry creator Pierre Hermé, British pop-artist Jamie Hewlett and Emma de Caunes, actress Sandrine Kiberlain and journalists like Apolline de Malherbe from BFMTV or Christophe Ono-dit-Biot, writer and Deputy Director at Le Point. The exhibition will be open to the public until October 23, 2017, and has already been widely celebrated by an enthusiastic press.